When a book is in our hands, it lives or dies. That is the work. We read, we think, we write. We carry the load, we handle it, we sweat. That is the work. We can all do it. This book offers a sense of what work is in a certain time and place. This is a book of essays and poems, poems by a teacher and by his students, it is not a book about how to teach or what is wrong with education. But it raises a challenge. It extends a hand. Look at what these students do. Look at what it means to be among them. Listen to what that asks of us. Look at the city, the place, in which this happens. It is a place not unlike your own. In this collection, Kip Zegers has transformed his life as a teacher into compact, finely tuned poems. 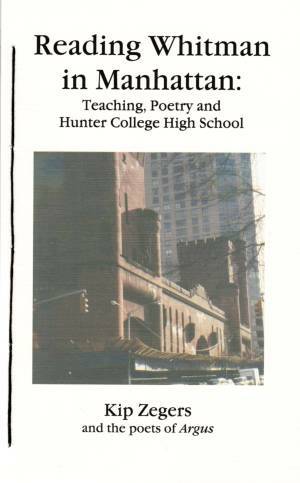 He has written “a soul of the teacher book,” as Dr. Eileen Coppola, Principal of Hunter College High School, has said. Within it, of course, Zegers has featured the voices of his most creative and talented students so that their language and lyricism may inspire other students to devote their efforts to reading and writing poetry. The poems may also help readers to sense worlds that they had not previously known. faces gone to subways and the difficult streets. for the week. Slowly the pale room fell silent. Outside the hall was sticky with spilled soda. not looking out, their privacy complete. place of chances, second chances, sweat. out of the oldest fear there is. had opened and called my secret name. These students consider the possibility. even as they sit in a circle. somewhere, underfoot, in the air? is as far as they can go alone.